I always just thought they raised the wings to land the ship...is there a reason we can't still assume this? I mean, wings-down, they'd be broken in half when the BoP touched down on a planet. Traditionally there's 3 standard positions. I don't think anyone disputes that the purpose of position 1 is for landing. The debate is the significance of positions 2 & 3. Given those screen grabs from WoTW (lets call it Position 2.5) I'd say it's safe to assume that the wing positions are a trade off between engine efficiency (particularly at warp), maybe even sublight manoeuvrability and the weapons fireing arc and targeting accuracy. It would be up to the Captain of the BOP to balance those factors by choosing a wing position. So when Martok's squadron did a hit and run on that ground base, it was wings down for maximum effectiveness, quick and surgical, though slightly reduced manoeuvring capability. When they're following the Defiant it was wings high, but not totally in cruise mode so they have a better chance of defending if need be (uncloaked), but still have enough speed to keep pace. ...Or then the BoP might have suffered some damage in combat with the Defiant - including hits on the wing-folding mechanism. Consider also that a BoP might not be the fastest bird in the flock, at least compared with a Vor'cha cruiser. The smaller ship would be struggling to keep up with the larger one, and not making any compromises regarding speed. Then again, it's a bit odd that a Vor'cha couldn't catch the Defiant, which herself is slowish by modern Starfleet standards. Surely the Klingons would wish to build their newest capital ships to be competitive with Federation designs? So perhaps the Klingons were deliberately holding back here - possibly with instructions from the Martok Changeling to hold fire, so that the many Founders Sisko had aboard would not come to harm. Sorry, I wasn't very clear, I did actually mean the BOP was trying to keep pace with the Vor'Cha. Mind you, I just had a look at Memory Alpha and yes, the Vor'cha can pull around Warp 9.5, while the BOP is stuck at 8.1. It dosen't actually say what the Defiant's normal max speed is, just that it can get 9.6 if they take the weapons offline and I'm not sure if they did that in WotW. Then again, the DS9 tech manual (not the best source, I know) rates the B'rel-class at 9.6. It's all speculation really, but my idea literally hinges on the possibility that Warp Coils are effectively bolted to the wing frame, under the cowls and when the wings move, it effects the warp field geometry, just like on Voyager. Who knows, maybe the designers of the Intrepid-Class got the idea from the Klingons? I'm rather fond of the KBoP-Intrepid connection there. It's also worth noting that in "Return to Grace"[DSN4], Dukat's freighter attacks an unshielded Bird of Prey with its craptastic phasery thingies (before mounting a big honkin' disruptor to the ship). They target the underside of the Klingon main hull, the statement being made that it was the weakest spot. Why this would be so is uncertain, and unless it was somehow a design necessity (e.g. the egress/cargo doors or something) it doesn't stand to reason that it would be a necessary design flaw for a century or so. However, on the smaller KBoPs one could reason that the down position is intended to provide some measure of additional protection for the area. On the way-too-big BoPs, it's possible that this area is not weak and hence the down position was not required. The fact that the ships still appear to have all the swing mechanisms is just one of those things. This whole protection thought is silly overall, since the extra mass and complexity of the swing-wing design seems quite wasteful, even in an in-universe sense. Better to stick a couple of hanging-down Cadillac fins on her and be done with it. The only other significant possibility I can imagine is that the wings contained some sort of maneuvering thruster engines of some kind, perhaps even all along the dorsal and ventral surfaces of the wing, and the down position allowed their use in a lateral direction. What to make of the fact that the BoP (in its possible three differently sized incarnations and the ENT era precedent) is the only Klingon ship to have this fancy feature? It's not a Klingon trademark as much as it is a BoP one. 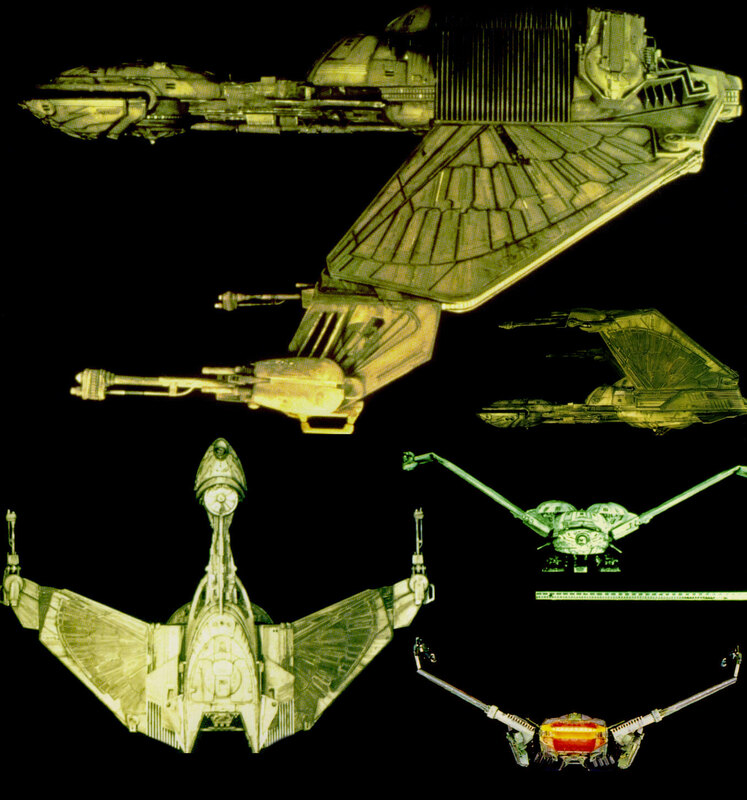 It could be that the BoP series are the only landing-capable ships in the Klingon arsenal (yes, the "Defector"/"Y's E"/"Rascals" giants included), and that the wing flapping is there purely for aerodynamic and landing-geometry reasons. So the various wing positions are meaningless in space travel and combat, and indeed we never quite see a BoP adjust its wings for space activities! All the actual movement happens either completely off screen or within an atmosphere. That is, the wings are never "dropped down to combat position" - they are in the lowermost position during atmospheric flight because that's the aerodynamically most advantageous position for them during atmospheric combat, and most skippers see no need to move them to any other position while in space. They are never "leveled for warp", either - they are in the middle positions because skippers forget them there after taking off from a planet and utilizing the maximum aerodynamic lift of that configuration. For some mysterious reason, I'm beginning to favor this explanation. Mainly because then there is no "multifunctionality" to the wing flapping, no compromise in engineering or operation: no association with weapons positioning or warp dynamics. The fact that the wingtip cannon happen to move with the wings is wholly incidental, secondary to the aerodynamic main purpose of wing movement. I seem to recall the BoP in TSfS shooting the Merchantman to bits, then raising wings to middle position, "cruise". Wasn't that the case? Also, it was the first ever scene with a BoP, I guess they wanted to showcase its features. The wingtilt after killing gave it a very casual and cold air, I thought. Also, when the Bird decloaked it's wings were up and only dipped the wings when it attacked the Merchantman. Whatever technical justification we invent, the film maker's intention here is clear. The bird of prey likes to kill with it's wings down. Maybe it's got no actual techincal reason & it's just there to look intimidating. These ARE Klingons, after all. I think that's an element sure, why else use feather patterns and hulls that are unmistakably bird shaped? Just as the Vikings carved dragon heads on their boats, so the Klingons do with birds. Still there has to be some practical element in it, otherwise why don't the D7, Vor'Cha and Neg'Var classes do that, or something similar? Personally I'm sticking firm to the warp coils/field of fire/targeting accuracy argument. Oh and as for the belly being the weak spot, I think this is mainly because the belly is the cargo hold, which means a big open volume, with the engines right above. So all you need to do is penetrate the outer hull, into the cargo hold and you have a clean shot at the impulse engines, or deuterium tanks or whatever a BOP runs on (I surmise from ST:IV that the whole thing, impulse and all runs off the dilithium reactor, but who knows?) I think this is why we've seen several Birds completely blow up with just a single shot, because it's so small and the power systems so closely packed together (to say nothing of the torpedo magazine that's sat under the bridge) that once it take a fatal hit, it starts a chain reaction and the whole thing goes up like a Roman Candle. You could say this is intentional on the part of the designers, as the BOP was primarily a scout and it's best to make sure that if the ship is destroyed, best not to leave survivors behind for the dishonour of being captured, or for any intelligence to fall into enemy hands. I suppose the key to dealing with a Bird of Prey's glass jaw is to strike and run. I'm actually starting to seriously favor the maneuvering thruster idea . . . i.e. that the dorsal and ventral wing surfaces have some sort of thrusting apparatus on them. 1. A DS9 episode shows the rear glowing assembly flashing when the ship goes to warp, and indeed model shots suggest that there's more than merely an impulse thrust vent there. Thus, much as I always preferred warp wings, it's likely that the rear of the KBoP is basically a single propulsion stack, with assorted warp and impulse giblets all crammed together. 2a. Warp flight might not be affected by wing position. Thus the pursuing KBoP with wings down or mostly-down would've simply been prepped for impulse combat. If true, then the areas toward the end of the wing would be the best place to put one's maneuvering thrusters. If these are limited to the upper and lower surfaces of the wing for whatever reason, then swinging the wings downward would allow for greatly enhanced maneuvering capability. 4. Though not necessary, we could go further with our surmise. For instance, drive products could be taken from the impulse engines and sent toward numerous apertures near the far-edge of the wings, perhaps near the end of the feather-pattern-wingtips. The remainder of the wing closer to the main hull could be doing something mundane like holding fuel, or else it could have some sort of driver coils ramping up the effective thrust. Either (or both) would at least give the main area of the wings more to be doing than sitting there and looking bird-y. But alas, I'm sure there are problems with my suggestions. Please poke as many holes as possible. This just made me laugh - how appropriate that a Bird of Prey would have giblets! Please poke as many holes as possible.